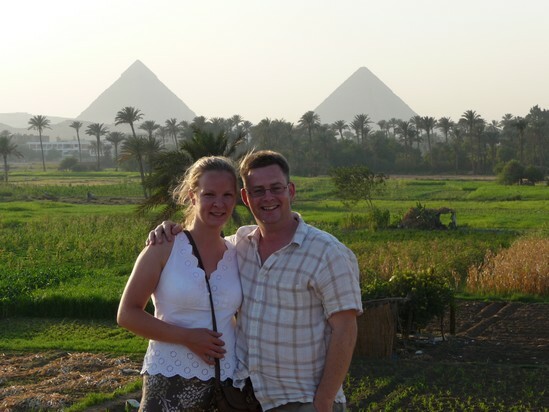 Last night we took a trip over to the Pyramids of Giza with Frank and his Niece Paris to see the pyramids sound and light show. We were really looking forward to it, having seen these amazing 4,000 year old monuments all our lives in documentaries etc. and it was truly inspiring. Their extraordinary shape, impeccable geometry and sheer bulk made you gaze in awe for hours. 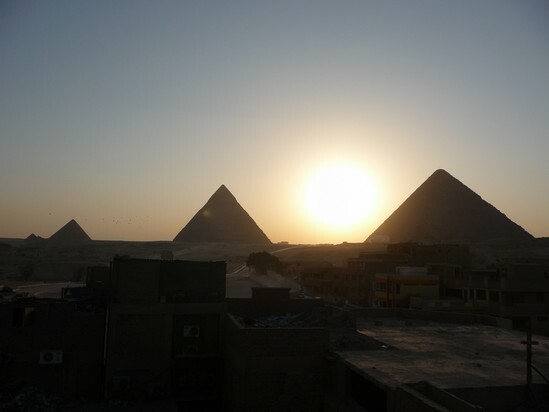 Frank suggested we take in the show first before visiting the pyramids up close, as it would answers our never ending questions on ‘how they were built and why? in the form of a visual display. It was brilliant – a bit too ‘Hollywood’ in some of the effects, but so interesting. 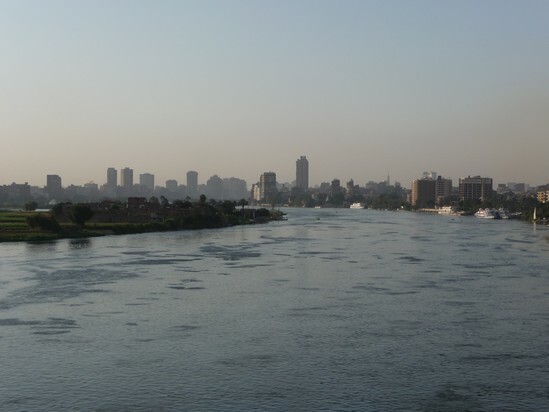 It explained the importance of the Nile to both the pyramids and to the greater Egypt. It was difficult to take photos in the dark, so you’ll just have to come and see it yourself. We are heading back today to spend another few hours walking around and, depending on the crowds and heat, visit the inside of at least one pyramid. Each pyramid is constructed differently, so each tells its own story. It’s been a long time since a tourist attraction has taken our breath away – we can’t wait to visit again today. It all looks wonderful (apart from Davey’s haircut! 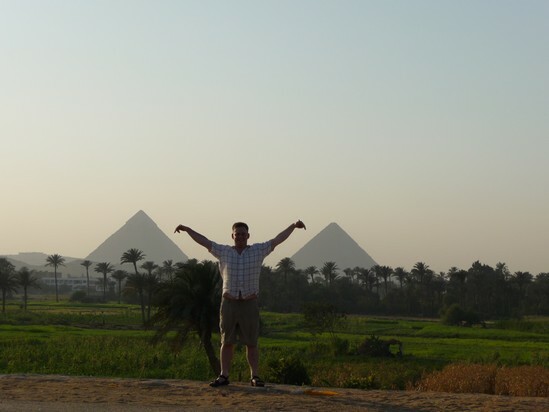 ;-)) – real pyramid selling! Will have to go there. So glad you are having such a great time. Awesome!! good pics !! despite the lack of light!! Davey and Sam, first great shots of thr tour. Simply amazing!! been thinking about you since Egypt, love the elelphant pics at the Park. I see you perfected the art of bargaining in your stay in Cairo. Made it home safe to US last night, after a Layover in London, and a restful nights sleep on the Heathrow Bus Central concrete floor. Traveling is a hoot. I want another ping pong rematch, the pics are great, Paris and I have many stories to tell you someday, especially the one in Luxor when I wouldn’t get out of a van until they paid me my money back from a failed balloon ride attempt. I love the blue bug pic net over the bed in Chitwan, we needed those in the African Hostel, I stayed there my last night and those pesky little buggers tried to drain me of all my Egyptian Blood. 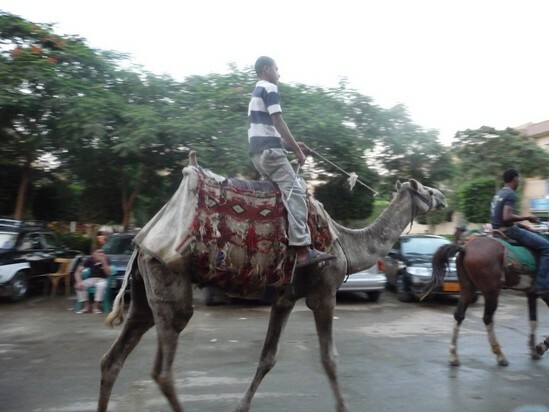 I do have one note: the last night Paris wanted to ride horses at the pyramids, at night. Out to Giza we went, rented horses, went up out to desert overlooking Cairo with a 360 degree unobstructed night view of Giza and the light show (Omar Shariff) at the Great Pyramids, had a smoke, watched the moon set over the horizon, and when we got back to the stables and our guide, who all night tested my resolve, with multiple offers of papyrus shops and the like, finally said as we were leaving, Marco (Frank) you are now half Egyptian. It didn’t hit me until later how significant that was. 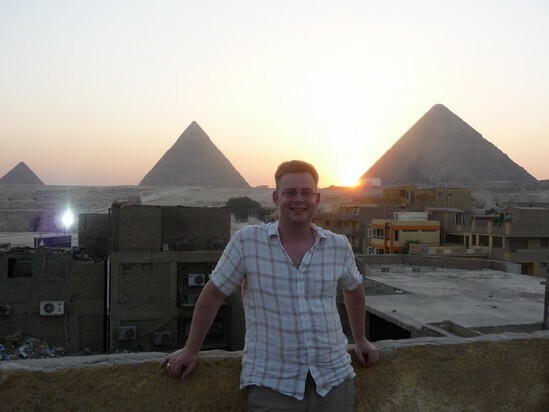 I know you guys are meeting lots of new friends, I put you two at the top of my list of genuine friends on my Egyptian Adventure, even if you beat me at ping pong. Oh, well. The pics are great, I like the way you look for a different angle, some of the ones I took in Asuan and Luxor were unbelievable. Will be posting Paris’s and I trip soon, will send you a link. Stay safe, have fun, I have remembered a lot of our conversations in Egypt, those are the things pictures can’t capture. 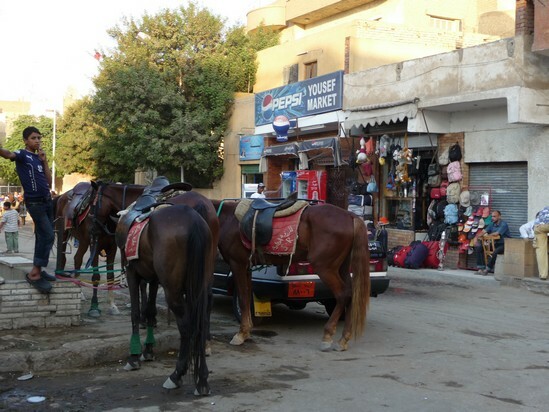 Oh, and we ended up our trip at a really nice place on the red sea, El Gouna (www.elgouna.com). 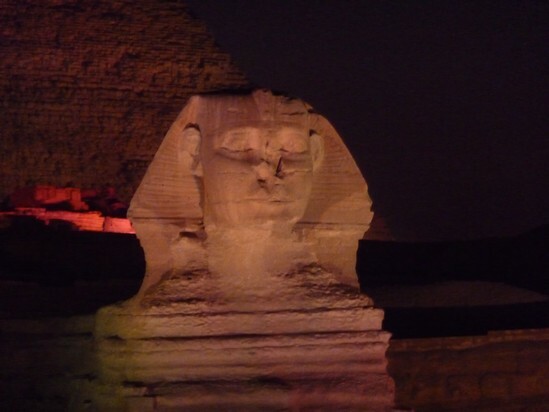 It is worth the trip, private, gated, it didnt even feel like Egypt, not one person came up to me or asked me for anything. Kind of a let down actually. The diving was incredulous. Love your blogs, can’t wait to have a drink or two with you guys again, sooooon.